Earlier I mentioned that we have been slow to get in the holiday spirit. This year we didn't have any plans for get-togethers at our house, so we were considering doing minimal decor for the year. But, in the end, we were able to put together the Sanford-Fried-Oysters-traditional get-together our house. That was enough incentive to put up all of our Christmas decor. (Of course we haven't finished putting everything up, but we do have a tree). Jade was responsible for the top half of the tree and Ivy had the bottom half to cover. 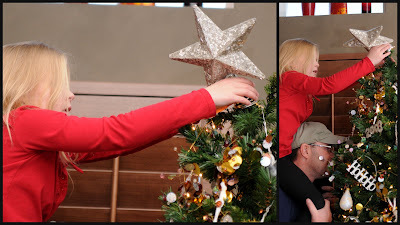 It is typically Scott's responsibility to put on the star. This year he let Jade put it on with his assistance. 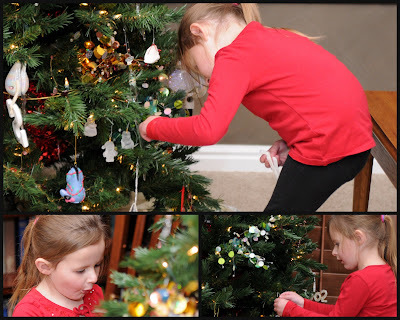 When I was little, my mom would prep the tree before we (the kids) got to decorate it. I've carried that tradition on in my little family tree. 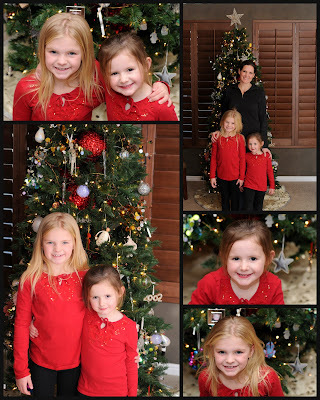 I prepped the tree by putting on the little sparkle sprays throughout and then let the girls have at it. You will notice, Ivy tends to clump everything together. I was getting a little impatient during the process and Scott had to remind me that it should be a good experience for the girls. I needed to be reminded that it is okay if the ornaments are in clumps, if there is nothing at the top of the tree and if they are making pained faces in the posed pictures. After the reminder, everyone had more fun and the kids and Scott wrestled around the tree. Look, another picture of me. Crazy how many pictures there have been of me recently. Scott keeps forgetting that I am the one that is behind the camera avoiding the front of the lens. 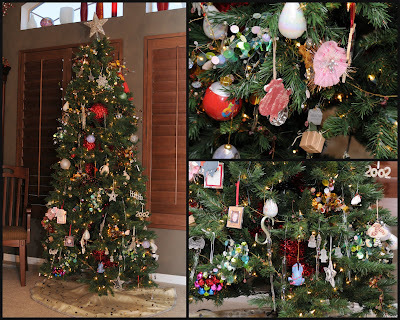 Lastly, I was so proud of myself, the other thing my mom used to do after we would decorate the tree and were sound asleep, she would redecorate the tree so that it would look more balanced. That tradition, I didn't carry on. I left the tree exactly as they decorated it. Believe me, it was hard, but I did it. 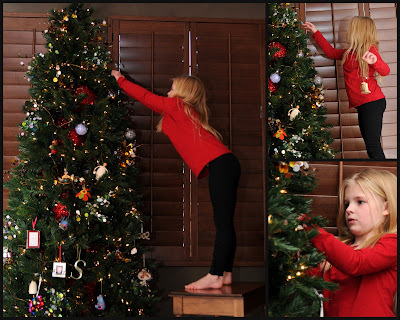 Hey Amy, I have the same conflict when my boys decorate the tree! This year I didn't do such a great job of being less concerned, but I did leave the tree decorated the way they had it. Baby steps! Your tree looks beautiful! The girls did a wonderful job! !